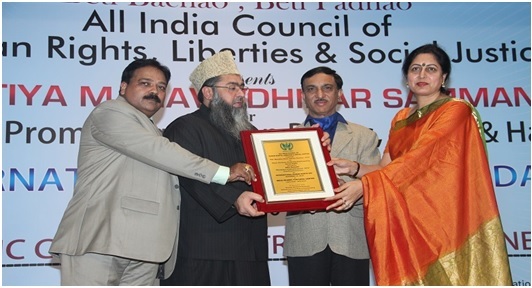 To mark the celebrations of Human Rights Day on 10 December, 2016, the All India Council of Human Rights, Liberties & Social Justice (AICHLS) organized an award ceremony in India Islamic Centre to bestow honours on individuals whose contribution to the understanding of effective leadership has resulted in extraordinary impact, transcending all boundaries. In pursuit of the same, the Principal, Ms Alka Awasthi was being conferred with Exemplary Leadership Award for demonstrating phenomenal personal commitment to her organization and thus enabling the group to fulfill its missions and goals. For the students of K.R Mangalam World School, G.K-II, the function was a leap forward to celebrate Human Rights Day with their performance on ‘Saving the Girl Child’ and ‘Ganesh Vandana’ which received an overwhelming response from all. No wonder the motto ‘Together Towards Tomorrow’ brings out the creativity and talent present in every spirited member of KRM where together they can take the world by storm.